But it just goes to show how difficult it is to find something that is truly your own online now, because I’m starting to come across more and more competition for it. I never thought to acquire the domain name back in the day but I notice from the Wayback machine that zzyss.com has been occupied since at least 2001. I’ve seen a Spanish(?) shoe store (Zapatos y sandalias) and various Chinese websites where the letters are rough abbreviations of the pinyin (e.g. 中原书社/Zhōngyuán shūshè – “Central Bookstore” and 诸子喻山水/Zhū zǐ yù shānshuǐ – “Scholar Yu’s landscape”). I have no idea what other uses that simple five-letter combination has been called into service for but boy they’ve sure gotten around! Anyway, that’s all. I’m only posting this ‘coz I was annoyed that some Chinese dude’s gone and reserved my name on Origin. But man, if I ever find out that anybody else is using “cyberseraphic”, there will be a reckoning. I’m very proud of that little neologism, which I created out of a great admiration for a Neal Stephenson book title, Cryptonomicon. More on that another day. How are you guys? Long time no see… I’ve been so busy with real world stuff that I haven’t had much chance to blog. Don’t worry though; I’m still jotting notes and adding to my ever-increasing list of draft posts faster than I’ll ever be able to clear them. Alright. Let’s talk about monopolies. I’ve been thinking at great length about buying an iPad. So much thinking, in fact, that after 3 generations I still haven’t bought one yet. I’ve bought an iPad for each of my three sets of parents but not myself. In theory it should’ve been a no-brainer after Apple released the New iPad with the retina display. After all, that was the one feature I’d been eagerly waiting for. I already own an iPhone and Macbook Air, and spent copious amounts of time and money accruing apps and content through iTunes and the Mac App Store so it’s not like I haven’t already sold my soul to the cult of Jobs. But therein lies the problem. I feel like I’ve unwittingly invested too heavily into the Apple ecosystem without proper consideration, and I’m wondering whether I’m putting all my eggs into one basket. Let me back up a bit and explain what I mean by the Apple ecosystem – I’m not just talking about owning a bunch of iDevices. Those are just a variety of different-sized windows into the content world that Apple has built. Media (music, movies, games, etc.) isn’t what it used to be. CDs are likely to be the last of its kind, a brand-agnostic platform that can be played on hardware manufactured by any company (most likely Sony, who we’ll come back to in a bit). Today, when you buy something from iTunes, you’re no longer receiving a physical product, but buying into the company. 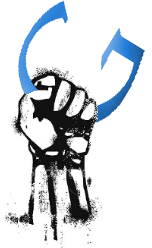 Sure, progress in the area of digital rights means that you can get a file in a standard format, without restrictive Digital Rights Management (DRM) schemes so that can be played on devices from other manufacturers, but ultimately if you accidentally lose the file, you’ll go back to Apple – why would you pay for a replacement copy when you’ve essentially purchased a life-long right to it so long as you keep using their system! How is this a bad thing, you say? It’s that old saying: the medium is the message. We think we’re buying songs, movies and games, but really, the content itself is free (another topic that I hope to cover in depth in a future post) and the money that you pay goes entirely towards building the ecosystem through which it is distributed. The money that artists and developers receive isn’t payment for their intellectual property – it’s a commission, albeit a fairly large one, for helping Apple to sell their platform. Taken to its logical conclusion, Apple’s success reduces choice. The bigger they get, the harder it becomes for anybody to compete with them. Like the banks, Apple too will become “too big to fail”. In all seriousness – and this has nothing to do with my being a member of one of their social media marketing groups – Sony is the only company in the world with interests in the critical parts of the content ecosystem to be able to take Apple on. The reason why they’re struggling is because they haven’t been able to corral their offerings to deliver a consistent customer experience. Both Google and Microsoft lack coverage in the consumer electronics space, and must partner with other companies such as Samsung and Nokia to even be in the game. Likewise for content – merely providing a conduit (marketplace) for content to be sold is nowhere near the same as being able to offer an integrated multi-device platform (both Apple and Sony), or actually owning the content (Sony). Content is the lifeblood of devices, and with each additional device I buy (i.e. the New iPad), the more I must invest into buying content from Apple to make that purchase worthwhile. I’m not so loaded that I can afford to buy the same content through both iTunes as well as Sony’s ecosystem (in order to be able to watch shows on TV through my PS3). If I buy the iPad, then I’ll be more inclined to also buy an Apple TV so that I can watch iTunes video content on TV. Hehe… given the above, can you imagine what kind of buyer’s remorse I’ll suffer after buying an iPad? And that’s why I don’t have one yet. Since reading Nicholas Nassim Taleb’s The Black Swan, I’ve been seeing gaussian fallacies everywhere. Let me back up a bit and explain: the story goes, Europeans observed that swans were white throughout all of Europe, which they extrapolated that into a theory that all swans around the world must be white. But when explorers came to Australia and discovered a Black Swan, their theory was immediately invalidated. The implication is that Black Swans can happen anywhere, at any time to invalidate theories and models. This applies to technology. Experts want us to think that just because the 128-bit encryption standard used to protect our personal data takes a supercomputer a squillion lifetimes to crack, it means that the systems protecting our sensitive information are secure. Yet the recent of Sony Playstation accounts, adding to the growing list of major security breaches in recent months, tells an entirely different story. 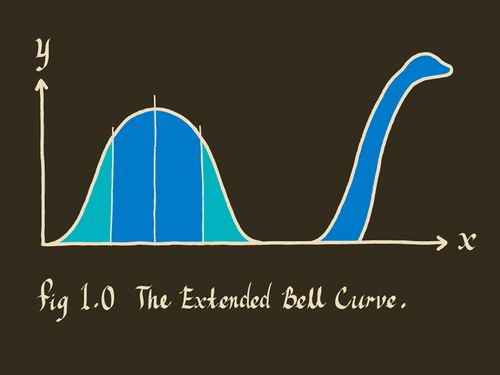 What’s to say an event from either extreme of the bell curve won’t happen in the first 20 seconds? Just because it takes a computer an eternity to crack the code, doesn’t mean that the result will only be known at the very end of the calculation process. For example: I pick a random number between 1 and 1,000,000,000,000 and ask you to guess it. In the absence of any other limitations (i.e. time restrictions) you could either take potshots at it by selecting numbers at random, or you could just start by guessing 1, then 2, then 3… and so on. If that random number happens to be 12, the second approach would have gotten you there in mere seconds. But I digress. The point is, we’re being fed a Gaussian fallacy with encryption. The real threats are whatever means hackers and other nefarious types are using to bypass security – those are the “black swans”. I daresay the same thing applies to password selection. Is “password” really that much less secure than “Gh$h26Sd!0” if the vector of attack is a colleague installing a keylogger on your computer? Post back in the comments here if you see any examples of Gaussian fallacies in your life. * The title is obviously a pun on “proceed with caution”. I know “Gauss” rhymes with “house” rather than “horse” but I’ve always pronounced it “gore-shan” for whatever reason. Having gone over my Internet usage quota for the second month in a row, and with a very high chance of making it a hat-trick, I finally bit the bullet and upgraded my Internode plan from 10Gb to 150Gb. With ISPs offering 1Tb plans these days, I often got asked why I stuck with such a paltry download limit. In short, I didn’t need it. The only reason why I even got close to 10Gb is because of the increasing number of computers, smartphones and gaming consoles Jenny and I own, each of which demands a constant stream of data to stay updated. The new quota is 10 times* more than what I’m likely to use. My intention with this post isn’t to lay the gratuitous smack down from atop the lofty heights of my moral high-horse, but to explain my personal choice, because there are so many people – otherwise intelligent, rational, critical thinking people – who are baffled by it. How is it possible that a self-professed digital junkie like myself uses so little? The answer is simple: I don’t pirate. Many of you know about my strict stance against piracy: I simply won’t download anything from the internet – movies, TV series, software – that I didn’t buy from a trusted, legitimate source. One time, I unwittingly bought an extremely convincing pirated DVD and upon discovering that it was fake, completely refused to watch it (much to Jenny’s ire). I have a drawer full of Wii, PS3 and Nintendo DS games that I haven’t gotten around to playing. My desktop PC contains yet more, although because those were purchased digitally via Steam, I often forget that they’re even there. ABC iView** provides plenty of great viewing for veging-out-on-the-couch occasions, then the Websites that I’m subscribed to, as well as physical media – after all that there really isn’t much time left for anything else. As a person firmly entrenched in the affluent upper-middle class, paying for content is one way of preventing overconsumption and being more discerning in my choice of entertainment. 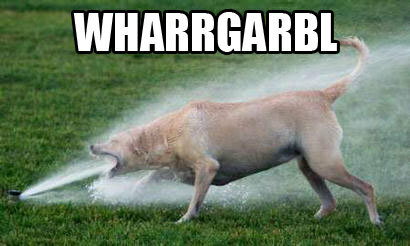 Giving oneself the option of downloading content is like drinking from the firehose, and I can quite easily occupy my time without it. Being on the right side of the moral and legal argument is just candy. I used to be the biggest pirate when I was younger, so to criticise others who are doing it now would be hypocrisy. Have a think about it. If you’re suffering from the symptoms of information overload – you feel boxed in, you’re constantly overwhelmed, or your life seems bland and boring, and you can’t find the time to do the things you like – consider if turning off the tap of “free” entertainment and experience a new kind of free. While reading an article about Larry Page in Wired magazine this morning, it occurred to me that Google is essentially one, big, global experiment in socialism. At it’s core, Google’s business model is simple: you give them your money (indirectly, by viewing advertising), and in return they give you tools that you use to do good (i.e. for the betterment of society, the flip side of their “do no evil” mantra). As a form of social organization, socialism is based on relatively equal-power relations, self-management and a reduction or elimination of hierarchical forms of management in the economic structure of society. As early as 2001, as the company reached 400 employees, Page worried that a growing layer of middle managers would bog it down. So he and Brin came up with a radical solution: They decided to do away with managers entirely. The HR team begged them not to, but the founders went ahead with the plan. Then there’s stuff like their support for open-source software, and the free food for staff, which are signs of socialist idealism. If the Wired article paints an accurate picture, Page – who recently took over from Eric Schmidt as CEO – would like everybody to give Google their money so that the company can “fix” all the “problems” with the world (like Chinese censorship, although their plan backfired badly). A little while ago I began to wonder whether I really want to live in a world defined by Google’s values. Yes, I was mocked in the comments about our dependence on Google, and it’s true that I won’t (can’t) stop using Google Search any time soon, but I am becoming increasingly wary of all the other free toys – i.e. the rapidly� multiplying number of Google Apps. Am I the only one concerned about the rise of a new kind of corporate communism?